The image below is a screengrab from my iPhone as I am pointing it down a street. 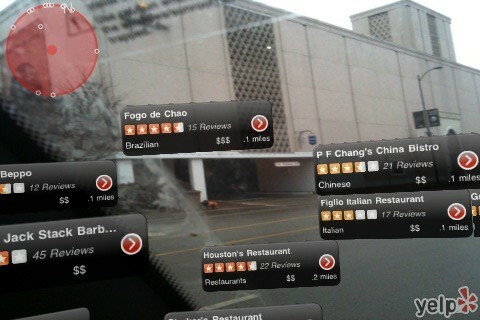 The phone is using an augmented reality feature of the Yelp! iPhone app called Monocle. What your seeing is that as I point the camera at a location Yelp! reviews pop on the screen. I can click through or simply choose to skip that shop I was going to go into based on the slew of two star reviews. If this image doesn’t get your attention that reviews on sites like Google Maps and Yelp! are important then nothing will. Yelp! also added a “check in” feature so people using the app can note when they visit a location. At some point this information will become very valuable and expect Yelp! to build advertising opportunities around check ins – on your 10th visit to a coffee shop you get a free drink coupon, for example. This could be bad news for location games Foursquare and Gowalla. 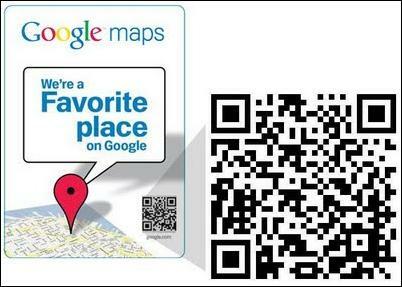 Google recently mailed 100,000 decals of “favorite places” it has listed in Google Maps. These decals have a square image, called a QR code. When someone with a QR reader on their phone snaps the code the business listing in Google Maps comes up – reviews and all. Now, admittedly, even my geekiest friends don’t have QR readers, but, like RSS, Google can build QR scanning into it’s Android phones like plumbing.